I love this sweet little car and I was amazed when I got the tiny license plate words placed exactly right the first time! I used a colour combo chosen by Heather on the PTI blog today as part of their anniversary festivities. Aqua Mist, Spring Moss, Kraft and Cream. I shaded the car with Copics, for the bumper, tires and some areas that would have shadows. I used Antique Linen Distress Stickles for the headlights. I used this month’s SFYTT for the layout though I’ll admit, I stretched it a bit, turning it 90 degrees for starters.Then I used the bow for one of the ‘circles’ and the buttons for the others. And I used a doily instead of the panel behind the white circle. While it doesn’t look quite like the original, I do hope they see the inspiration I took from it. ETA: This is also for Lily Pad Cards challenge to use patterned paper in your card. Paper: DP-PTI, kraft, vanilla CS-SU! This card is just the sweetest, most clever design! 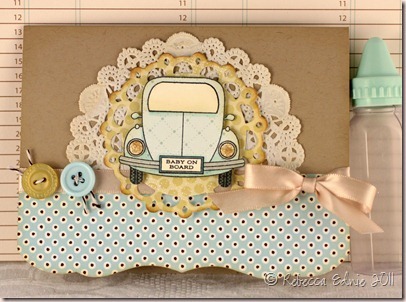 I love your use of patterned paper and the soft colors! 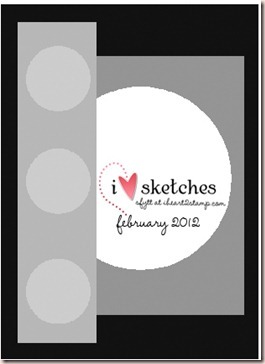 Thanks for linking this charmer at Lily Pad Cards! ACK! This is just the sweetest! Love what you've done with the February SFYTT! Thanks for joining us! Your card is so creative! I love the way you have framed the car!